On Wednesday, Clif and I went back to Cushnoc Brewing Co. for an early supper. For our anniversary, Shannon and Mike gave us a gift certificate to Cushnoc, and when it comes to having fun, Clif and I never shirk our duties. Our friend, Alice Bolstridge, met us, and before I post pictures of our meals, I am going to indulge in a bit of fancy. As I wrote in a previous post, Augusta was established in 1629 by English settlers from the Plymouth colony. Cushnoc, a Native American word meaning “head of tide,” was Augusta’s original name. So far, so factual. Now comes the fancy. I am a fool for Shakespeare, and I started thinking about the dates—how his death in 1616 was just thirteen years before Augusta (or Cushnoc) was established. I began to wonder, had any of the English settlers heard of Shakespeare? Perhaps even gone to one of his plays? Or better still, did any of them ever meet the great man? If the settlers were Puritans—and most probably they were—then it’s highly unlikely they went to one of Shakespeare’s plays. Still, it’s fun to speculate. Now back to pizza. 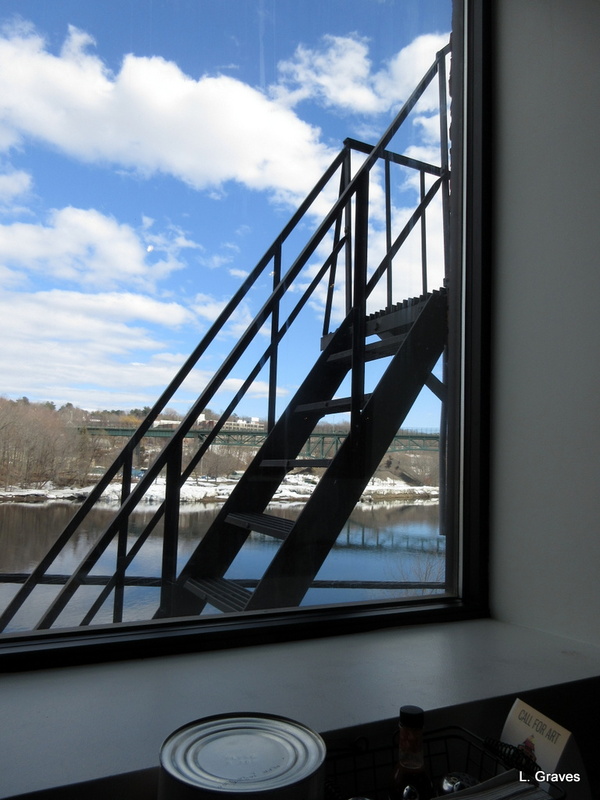 When Clif and I go to Cushnoc, we want to sit by a window that overlooks the Kennebec, and for some reason, I really like the juxtaposition of the fire escape with the river. 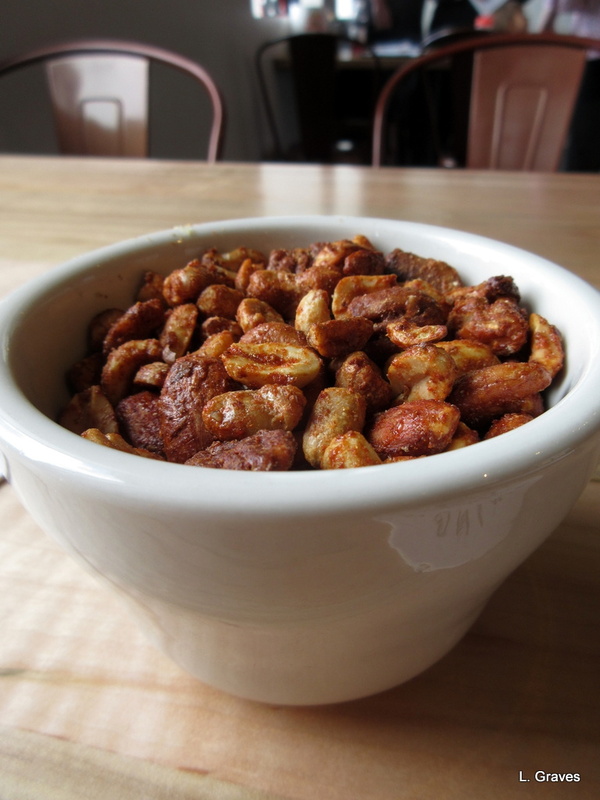 As an appetizer, Cushnoc offers some fire-roasted sweet and spicy nuts, and we can’t resist them. I’ve decided I want to learn how to make my own so that I can give them as presents for holidays and other events. And what goes along with spicy nuts? 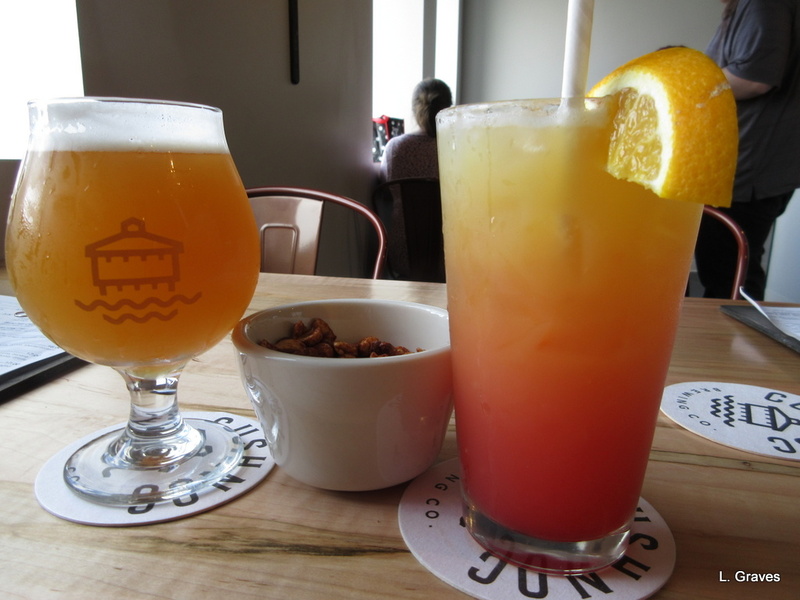 Why drinks, of course—a beer for Clif and a cocktail for me. Clif had a Belgian-style IPA, Eternal Golden Eagle. Quite a name! Clif thought it was good but tends to like the American-style IPAs better. I had a drink called a Belizean Sunset, a combination of vodka, orange juice, grenadine, and triple sec. My oh my, it was delicious, a creamsicle for adults. You might have noticed that the cooked pizzas are set on cans of tomatoes. A great idea. 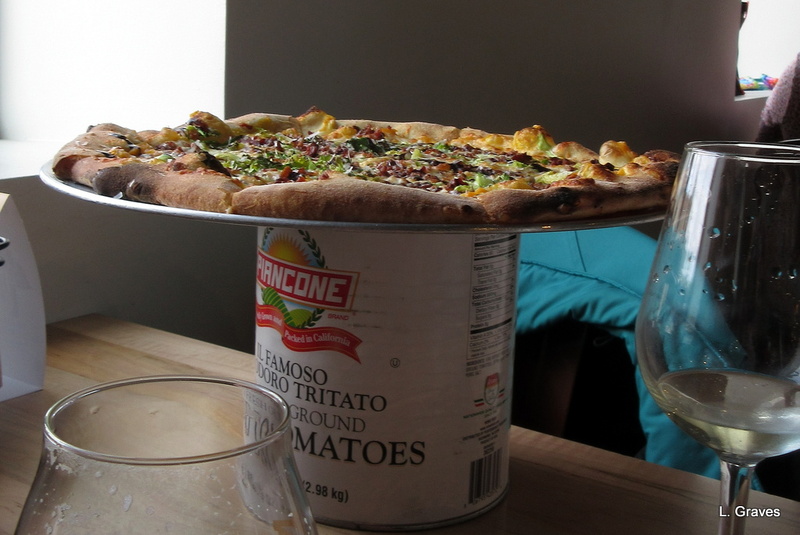 Just like buildings in a city, going up saves space down below, and at most pizza places, the table is too crowded with the pizza pans, the plates, the cutlery, and the drinks. So there you have it. Another terrific meal in, of all places, Augusta, Maine. My only complaint with Cusnoc’s is the noise level when there are a lot of people, and on Wednesday, the place was pretty darned crowded. Unfortunately, our aging ears can no longer tolerate a lot of background noise. The restaurant is cavernous, and I don’t think there is anything that can be done about the noise. But I do have a solution. In the future, we will go for an early lunch, before the place gets crowded. That way, we will be able to have really good pizza and still be able to hear what the other person is saying. Yum!!!! Glad you guys had such a good time and meal! Oh, the aging ears. We will be sure to go during their quiet times, for an early lunch. It really is a special place. Happy spring and Easter to you and yours! Interesting to compare dates of the settlement of Augusta & Shakespeare’s time … I like to compare the dates of historical events… Often surprises me. The pizzas look delicious. I totally agree on noise in restaurants! I know! Funny to think of the settlement of Augusta not being that far from the death of Shakespeare. Those pizzas were so good! I had trouble hearing in the curry house last night, but if you want to eat in a good place you have to put up with the crowds. I’m pondering on the brussels sprouts – I like sprouts but I’m unsure of them as a pizza topping. So true about good places and crowds. The Brussels sprouts were finely grated, and Alice’s pizza really was scrummy. Terrific meal, indeed. Your fantasy is akin to mine: what would Shakespeare think if he could see what the world has done with his work? holy guacamole! That’s quite a question, and of course we can only speculate. On the one hand, I think he would be appalled at some of the ways his plays have been, ahem, updated. On the other hand, he did a fair amount of updating himself. So who knows? Still, fun to think about. Such a fun outing! 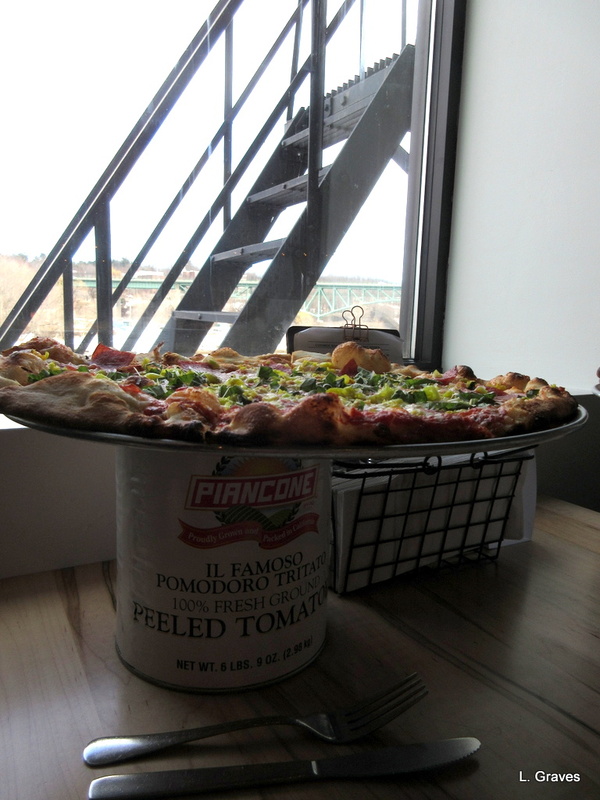 I wish we could find decent pizza around here–living in Buffalo for many years spoiled us. And, yes, the restaurant noise is an issue for us, too . . .
Too bad about the pizza! And, oh, those aging ears. We have a fairly local pizza place that is so noisy we have given up going there! I love creating time-lines and discovering all the events and people who lived and created in the same period! Oh, aging ears! Yes, funny to think of Augusta being established not long after Shakespeare died. I like photo of the nuts and I am curious about the recipe because I would like to try making them! Did you get any information? Not yet, but I will let you know when I do. I don’t think they will be at all hard to make. I make spiced walnuts, with cinnamon. It’s my guess it will be the same idea, only with some hot spices rather than the cinnamon. I’ll keep you posted.